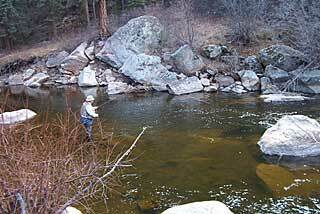 Description: The Bein Mountain Ranch contains about ½ mile of the 30-40 foot wide Big Thompson River. Good numbers of wild rainbows, as well as cutbows and browns thrive in this river, most in the 10-12 inch range and some exceeding 18 inches. Location: This property is located between Estes Park and Drake, approximately 1 1/2 hours northwest of Denver. Capacity: Limited to 2 anglers, or 3 if in one group.